You can, before the start of the official ticket sales, order tickets for you desired seats. You will receive regular information and an annual compilation of the press about the Bayreuther Osterfestival. You will also receive free of charge the latest benefit-CD with recordings from the Bayreuther Osterfestival as a thank you. In addition to these advantages, you will receive two tickets to the Matinée Festive. 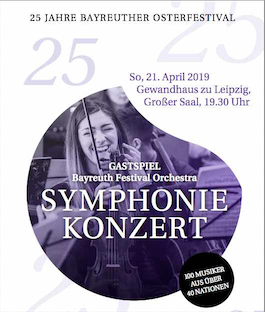 As a donor you will have a VIP status at the Osterfestival and, given the opportunity, you will be able to know the conductors, soloists and musicians in person, to take a look at the behind the scenes of the Bayreuther Osterfestival as well as to attend an orchestra rehearsal. Upon request, your name will be published in the program. Single person 30,- EUR p.a. Couple / Pair 50,- EUR p.a. Company, Organization, Association 150,- EUR p.a. Single person 200,- EUR p.a. Couple / Pair 300,- EUR p.a. Company, Organization, Association 450,- EUR p.a. Single person 500,- EUR p.a. Couple / Pair 600,- EUR p.a. Company, Organization, Association 750,- EUR p.a.